rings a bell! | Alasdair Malloy. January 13th 2012 7.20 p.m.: Just about to go onstage in Hong Kong City Hall for a concert with my friends in the Hong Kong Sinfonietta. Head full of script and a few cantonese phrases learnt by rote. You have to get the pronunciation just right or the meaning can change from perfect politeness to extreme rudeness! Phone rings – I was expecting a text from another friend in HK about meeting up the following morning, go to switch it off and then spot the caller’s name- Robin Smith, a terrific rock and pop arranger that I’ve worked with from time to time over the last twenty years, living in Australia as far as I was aware, but perhaps he’s in HK and spotted that I’m around. Decide to answer the phone just in case. He’s not. He mentions a rock legend we’ve both worked with before- ” He’s got a gig in London and wants you to play in the band”. Great, always fun to play with and we’ve performed in some amazing venues including Carnegie Hall in New York. Show in Hong Kong gets underway in spectacular style and it’s not until I’ve introduced the third piece in the programme and stand to one side as the orchestra plays that the full significance of the call hits me, swiftly followed by extreme panic – I remember that I’m booked to appear at the Aix en Provence festival for three weeks from the end of June, will this clash with the rehearsal period or even the ceremony itself? I have to wait until the interval to check my diary and am relieved to see that the ceremony is on July 27th and I finish in Aix on the 14th. Looks like it could work………!! July 27th: Well today’s the day, it has worked, arriving back from sunny Aix into soggy London and straight into rehearsals with some old friends and some new ones. We’ve prepared our individual parts prior to getting together as there was only one rehearsal in the Olympic stadium for us to sort out staging and sound check. Robin on keyboards, Jamie on clarinet and recorders, Luke on guitars and keyboards, Ash on drums and me on all sorts of percussion, all backing a renowned multi-instrumentalist, in a musical sequence put together by him in close collaboration with Danny Boyle himself. Sounds and looks great! At the first full rehearsal we discover that while we’re playing there will be thousands of performers out on the “Field of Play” and realise that the focus is not just on us, but once we’ve seen what actually goes on we grasp the full significance of the whole sequence- definitely one of the coolest bits of an exceptionally cool ceremony. 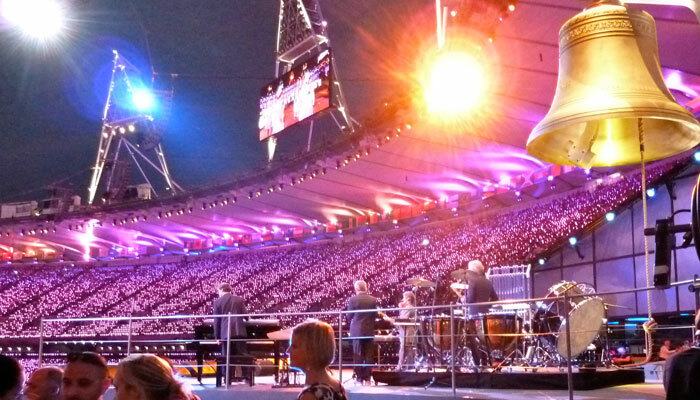 Two further dress rehearsals and we’ve now seen much of what’s going to happen, and even had some friends and family in to share the experience but Danny Boyle himself addressed the stadium full of guests and asked/insisted that they ” Save the Secret”. After all the hype of how things couldn’t match up to Beijing on a significantly smaller budget, I have to say that what we’ve seen is sensational and a truly joyous celebration so all sorts of things British, brilliantly conceived and stunningly executed. A privilege and a pleasure to be part of! Well all will be revealed very soon in front of an audience of world leaders, sporting legends and an estimated 4 billion TV viewers ( how many people are there in the world- how many TVs??) and I know from texts and emails that I have a significant bunch of chums scattered all over the globe who’ll be hoping for at least a glimpse of me. The wait will soon be over and they’ll all discover that not only am I thrilled to be part of what will be a truly memorable event but I’m delighted once again to be performing with Mike Oldfield.